Waves in Motion lets you control your FileMaker scripts | Thbthttt! As every FileMaker developer already knows, you can trigger a script when you open a file, you can trigger a script when you close a file, and that’s just about it. Anything else, and you have to rely on manual control or cumbersome applets that tie up you computer and slow down your applications. 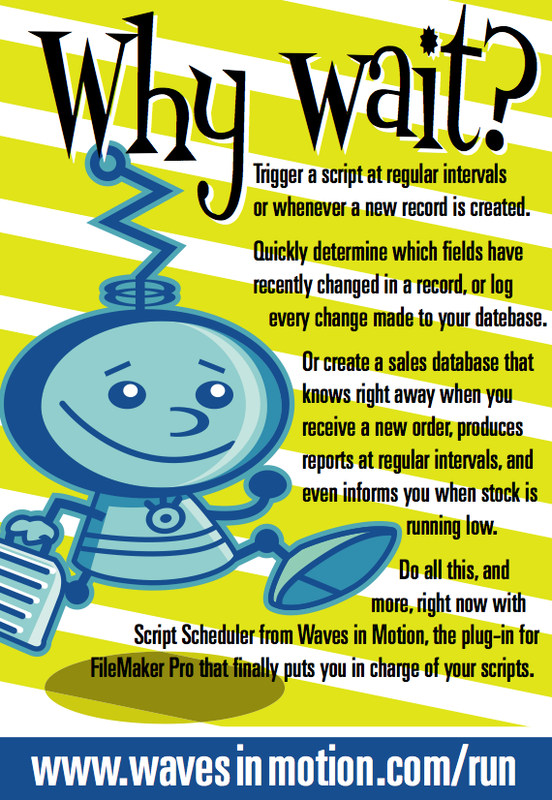 Script Scheduler is a new FileMaker plug-in from Waves in Motion that does away with these limitations. You can configure Script Scheduler to trigger any script in any file at a scheduled time or at regular intervals. Or even better, you can instruct Script Scheduler to trigger a script whenever you exit a particular field. All this happens in the background with no restrictions and next to no overhead. You can send doscript events as often as you want. You can stop and start the scheduler whenever you want. And, of course, you can toggle the field modification trigger so that it’s only on when you need it, and off during serious data crunching, when you wouldn’t want to be running a script for every record you modify. Imagine being able to trigger a script whenever a new record is created. Imagine creating a mission-critical application that can quickly determine which fields have changed in a record or easily create a log of changes to a specific field. Imagine creating a self-contained sales database that knows right away when you’ve received a new order, that produces reports at regular intervals, and that generates an e-mail notification whenever your stock is running low. This version allows you to try out all the features of Script Scheduler for a limited time. You can purchase single-user licence for $49.00 US by downloading the following order form and contacting Waves in Motion by phone or fax. Site licenses and distribution licenses are also available for developers who want to include Script Scheduler as part of their FileMaker solutions. Waves in Motion is the developer of several FileMaker solutions, including The Dragon, DocuScript, and the Analyzer. They are active members of the FileMaker Solution Alliance and the Apple Developer Program, and have been consulting and developing FileMaker solutions since 1990. 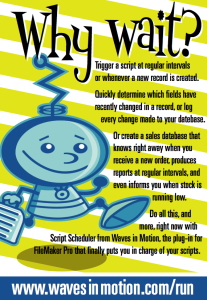 Script Scheduler is the first in a series of small, useful plug-ins from Waves in Motion designed to make life a little easier for other FileMaker developers while increasing the potential of FileMaker applications. Copyright © 2019 by Roy Schulze. All rights reserved. Website by Thbthttt! Based on Twenty Thirteen by WordPress.